I am from a family with a dry sense of humor. Often in the midst of a crisis we can be found making a joke that will make others around us smile. Holidays are usually filled with the sound of laughter, jokes and tons of talking. So this hand-stamped card represents the wacky humor and many surprises you are bound to find in our family. See this How-To Video below on this cool folded card! You, too, can create a quick and cool card quickly!! Wrap up this gift with this cute sentiment from the Christmas Tagables polymer stamp set. This silly and wacky stamp set pulled together to create a fun card. 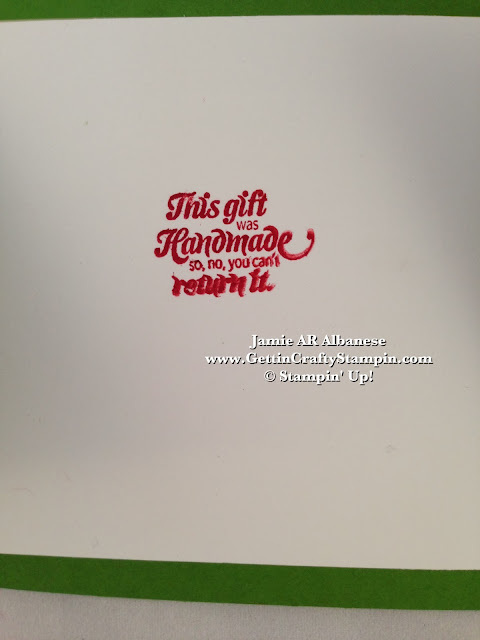 Stamp the 'Absolutely no peeking...' with Cherry Cobbler ink on Whisper White card stock. 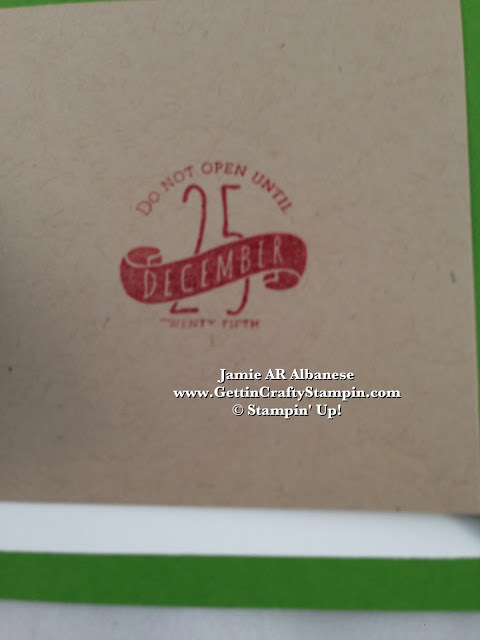 Punch with the 1-3/4" Scallop Circle Punch and with the Stampin' Sponge in Cherry Cobbler ink. If you are at all like me... tell me NOT to do something?? It is ALL I can do to honor your wishes - lol... I will either end up doing it or just mulling it over until I do - lol. My ever honest husband would be the one who wouldn't open this card until the 25th and it's STILL Funny! 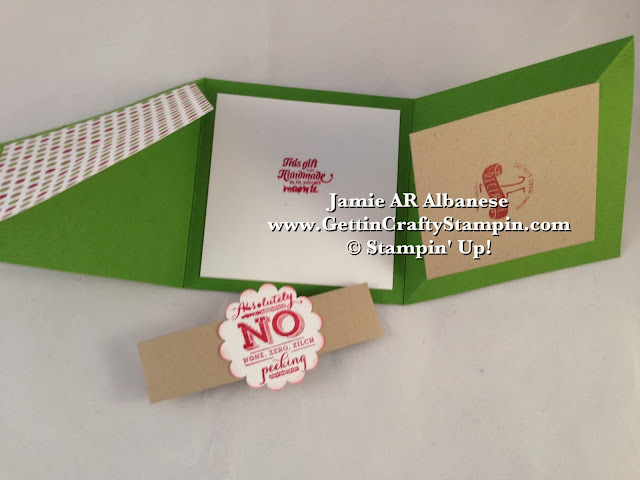 Using a strip of Crumb Cake card stock, create a 'belly band' that will help hold this interactive card closed. This 'peeking' is a fun way to embellish this card. With a 4" x 12" piece of Old Olive card stock create this folded card. (See how with the easy video tutorial below!) Using the Season of Style polka dot patterned page to frame the belly band and cover the stamped crumb cake card stock inside! Making this 3"x3" piece of Crumb Cake card stock stamped with 'Do Not Open....' with Cherry Cobbler for a cohesive and quick look. Having this second piece be slightly smaller allows for it to remain 'hidden'. With multiple panels giving a fun interactive look... you are sure to WOW while adding a few smiles to this Holiday Season! With 3 silly sentiments prettily penned, you will surprise those who see this with a fun sense of humor. WOW with the interactive and hidden surprises! See this easy HOW-TO Video on creating this card! Sometimes holidays are hard, we remember the hard parts of the year, those we've lost and miss... sometimes sending a fun card is a great way to show you care while send a smile to those who need it! I'm so glad that you came by! Come and visit often as I try to post daily. Bring your family and friends along for the fun and join me with my classes (in-person and on-line). If you know someone or are someone who has a funny sense of humor... you are sure to appreciate this card. I hope that it brings you a smile or two. Cheer someone during this busy and sometimes blue season with a little humor and WOW them with this fun and fast interactive card.